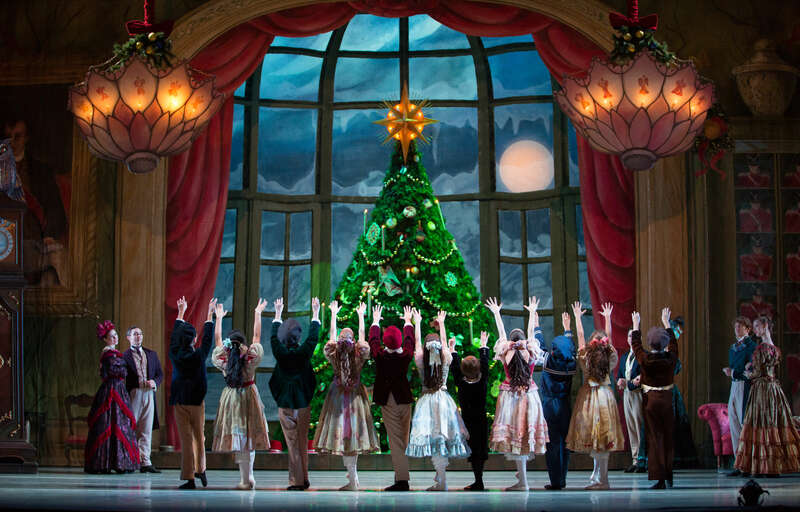 One of the must-see, top holiday events to catch in Philadelphia is the Pennsylvania Ballet's annual performance of George Balanchine’s The Nutcracker®. Pictured: artists of Pennsylvania Ballet George Balanchine’s The Nutcracker®. Photo by Alexander Iziliaev, courtesy of the Pennsylvania Ballet. Celebrate the holiday season in America’s birthplace! With one of the largest Christmas markets in the country, a giant 65-foot tree, a Made in Philadelphia pop-up market surrounding City Hall, a Holiday Carousel, Winterfest on the waterfront, and much more it is no wonder that POPSUGAR cited Philadelphia as one of the top places that holiday-lovers need to add to their holiday travel list. Photo courtesy of Christmas Village in Philadelphia. Philadelphia’s annual Thanksgiving Day Parade, in its 100th year as the oldest Thanksgiving Day parade in the country, is Thursday, November 28 at 20th & Market Streets to the Ben Franklin Parkway, concluding at Eakins Oval in front of the Art Museum. Christmas Village in Philadelphia returns to LOVE Park through Christmas Eve. The outdoor holiday market is modeled after the traditional Christmas Markets in Germany and features over 80 vendors selling hand-crafted goods. 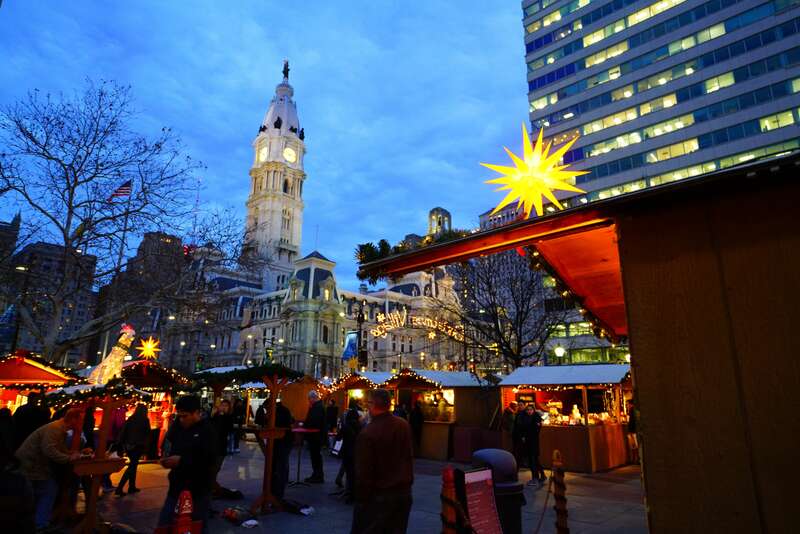 The Made in Philadelphia Holiday Market transforms Dilworth Park into a winter wonderland with more than 40 local artisans offering gifts and holiday foods through January 1. Deck the Alley features tours of the private historic homes on Elfreth’s Alley, America’s oldest continuously lived on street, as residents open their homes to the public for tours. Admission includes seasonal refreshments, colonial carolers, holiday stories and more. Take a Historic Houses of Fairmount Park Holiday Tour, “A Very Philly Christmas” as the six Fairmount Park “Charms,” Cedar Grove, Laurel Hill Mansion, Lemon Hill, Mount Pleasant, Woodford and Strawberry Mansion, are dressed up with themes for the holidays, with special events and more. Philly POPS Christmas: Spectacular Sounds of the Season returns to the Kimmel Center stage each December with 300 musicians on stage. The festive program features the 65 piece POPs orchestra with guest vocalists, the Philadelphia Boys Choir and the African Episcopal Church of St. Thomas Gospel Choir. Plus a visit from Santa and audience sing-along! The Philly POPS is the largest standalone pops orchestra in the United States. The Pennsylvania Ballet, one of America’s leading ballet companies, performs the annual holiday spectacle, George Balanchine’s The Nutcracker, each December, featuring the Philadelphia Boys Choir and the Pennsylvania Ballet Orchestra at the Academy of Music. The Philadelphia Orchestra celebrates the holiday season with performances including the Glorious Sound of Christmas, named for the Fabulous Philadelphians’ best-selling album, each December, with a program that includes favorite traditional carols. On New Year’s Eve, Yannick Nézet-Séguin rings in the New Year with a dance party, Verizon Hall, Kimmel Center, Philadelphia. Head back to 1840s London and join Ebenezer Scrooge and the ghosts of Christmas Past, Present and Future for the annual Philadelphia tradition of A Christmas Carol, based on the classic Charles Dickens novel, on the main stage at Walnut Street Theatre each December. For all ages. Ice skate with a view of the Delaware River at Penn’s Landing, the city’s waterfront district, at the annual RiverRink, Winterfest, Philadelphia’s largest outdoor ice skating rink, open seven days a week starting in November through March 3. And don’t miss the Rothman Institute Ice Rink at Dilworth Park and Wintergarden, right next to iconic City Hall, open seven days a week through February. Macy’s Grand Court Light Show returns each November through December. The show runs every day of the week (except Christmas Day) on every even hour from 10 a.m.-8 p.m. Best viewing times are Monday through Thursday. Also, children’s activities, photos with Santa, and of course, the Dickens Village. Macy’s is located inside The Wanamaker Building, a National Historic Landmark. Stop by Franklin Square for the Holiday Festival and Electrical Spectacle: Holiday Light Show, each December, as the park is transformed into a magical place with carols, dancing snowflakes, holiday music and more. A New Year’s Eve Countdown Night is December 31. Peddler’s Village hosts the annual Gingerbread House Competition and Display, a show of confections (over 75 entries!) in several categories November through the beginning of January, in the Village Gazebo, Lahaska, Bucks County, Pennsylvania. The Deck the Hall light show brings Philadelphia’s City Hall to life with the sights and sounds of the holiday season, November through January the beginning of January. Yuletide Cheers & Beers Tippler’s Tours return with colonial pub crawls through Philadelphia’s Old City through December. This Christmas, experience the spectacular both indoors and out at Longwood Gardens with A Longwood Christmas and living floral displays, opulent ornaments, stunning trees, musical performances, organ sing-alongs and much more, November through early January in Kennett Square, Pennsylvania. The Philadelphia Museum of Art celebrates the holiday season with special events, musical performances, caroling in the galleries, crafts, trolley tours of the historic Fairmount mansions, and more throughout the month of December. The Comcast Holiday Spectacular returns to the Comcast Center December through January 1, shown on the state-of-the-art Comcast Experience Video Wall, one of the largest LED screens in the world, spanning 83.3 feet wide by 25.4 feet high, capturing the essence of the holidays with performances by the Pennsylvania Ballet. 15 minute shows begin at the top of every hour, 10 a.m.-8 p.m. daily (except for weekdays at 5pm), 1701 John F. Kennedy Boulevard, Philadelphia. Independence Seaport Museum’s annual Parade of Lights takes place each December. The festivities begin inside the museum at 1 p.m. with live music, refreshments, visits with Santa, crafts, and more. At 5:30 p.m., the parade of festively decorated working vessels and pleasure boats begins its march down the Delaware River. Great views from the 2nd floor balcony overlooking the Delaware River inside the Museum. Join the Family New Year’s Eve Party, as the museum stays open late so visitors can enjoy the city’s 6 p.m. fireworks display from the 2nd floor balcony while enjoying a sparkling cider toast, December 31. Look for Scuba Santa swimming alongside sharks, sea turtles, and stingrays in the 760,000-gallon Ocean Realm exhibit at Adventure Aquarium’s annual Christmas Underwater celebration. The building is transformed into an underwater winter wonderland with larger than life decorations like the World’s Tallest Underwater Christmas Tree, Snow Shower Dance Party and more November through December, Camden, New Jersey. Sesame Place hosts A Very Furry Christmas Celebration, December through January 1, as the theme park is transformed into a one-of-a-kind Christmas wonderland with millions of twinkling lights and festive decorations. The Morris Arboretum’s popular Holiday Garden Railway Display features a quarter mile of track featuring seven loops and tunnels with fifteen different rail lines and two cable cars, nine bridges (including a trestle bridge you can walk under), and bustling model trains. The display and buildings are all made of natural materials (bark, leaves, twigs, hollow logs, mosses, acorns, dried flowers, seeds and stones) to form a miniature landscape with rivers and buildings that are exact replicas of the original including Independence Hall and other Philadelphia-area landmarks, all decorated for the holidays November through December. Catch Friday Night Lights, an opportunity to enjoy the display at night in December. The Brandywine River Museum of Art’s annual tradition of A Brandywine Christmas celebrates the season with the O-gauge model train display, featuring nearly 2,000 feet of track, trees decorated with thousands of “critter” ornaments, and antique dolls from the museum’s collection November through early January with related programming and events, Chadds Ford, Pennsylvania. The National Museum of American Jewish History hosts Being ______ at Christmas, the annual day of family fun, December 25, from 10 a.m. – 5 p.m., featuring live music, family activities, story time, sweets and more. At one of the lowest points of the American Revolution, General George Washington and a small army of men crossed the Delaware River on December 25, 1776, and led a successful surprise attack on the Hessian garrison at Trenton, New Jersey. The Battle of Trenton, a key victory from Washington’s Continental Army, boosted their confidence to persevere and ultimately triumph. Washington Crossing Historic Park, the actual crossing site, hosts the 66th Annual Christmas Crossing Reenactment on December 25 from 1 p.m. – 3 p.m. (crossing time at 1 p.m.), Washington Crossing, Pennsylvania. The Old Barracks Museum hosts the annual Patriots Week, December 26-31, celebrating Trenton, New Jersey’s unique and pivotal role in the American Revolution with dozens of events for all ages including musical performances, family activities, battlefield re-enactments and living history events. Spend the First Night of 2020 Aboard the Battleship New Jersey, December 31, 5 p.m. Enjoy dinner and breakfast at the “chowline,” tour the ship, ride the flight simulator and sleep in the bunks that the crew of the USS New Jersey once did, plus take in the unique view of the New Year’s midnight fireworks from the deck of the Battleship, Camden, New Jersey. The City of Philadelphia and SugarHouse Casino continue the tradition of two sets of fireworks on New Year’s Eve at 6 p.m. and midnight over the Delaware River. Launched from barges in the river, the fireworks are choreographed to unique soundtracks that can be heard from Great Plaza at Penn’s Landing and Wiggins Park in Camden, New Jersey. The Moshulu, the world’s oldest and largest square rigged sailing vessel still afloat, hosts a four course dinner menu on New Year’s Eve with live music and opportunities to view the fireworks on the Delaware River at 6 p.m. and midnight. Philadelphia’s Mummers welcome 2020 just as they have rung in just about every New Year for more than a century. The parade begins at 9am at City Hall, down Broad Street to Washington Avenue. Viewing areas include the Grand Stand on Dilworth Plaza at 15th and Market Streets and in front of the Philadelphia High School for Creative & Performing Arts. All the fun and fancy continues with two ticketed shows at the Pennsylvania Convention Center. Catch MummersFest, December 28-31, an interactive opportunity to try on costumes, watch the clubs rehearse, go on a backstage tour, make crafts and learn to strut.